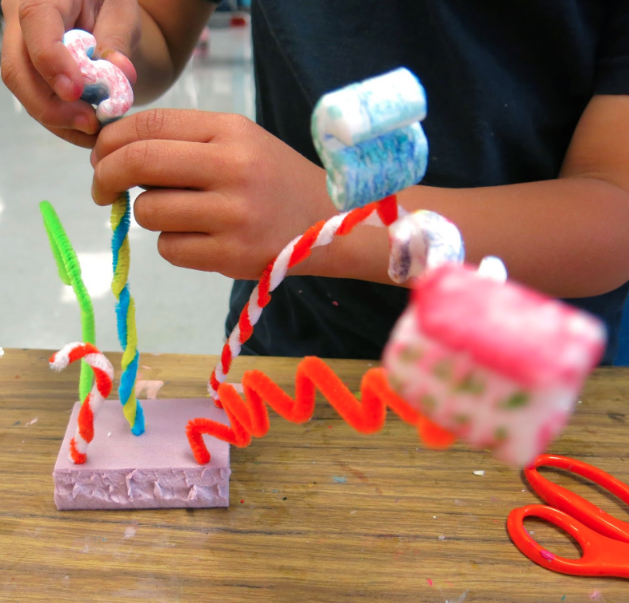 Cassie Stephens: My Favorite Sculpture Projects for Kindergarten through Fourth Grade! This week, on my podcast Everyday Art Room, I'll be sharing my favorite sculpture projects, materials and supplies. Since so much of what I'll be talking about is visual, I thought I'd also put it all together in this here blog post. Please be sure to click the highlighted links as those provide the full lesson and, oftentimes, a video lesson! 1. Toilet paper tubes! Just send out an email and you'll get more than you'll ever need. 2. SCHOOL paper towel tubes! The paper towel tubes at my school are super sturdy and thick and are my fave for sculpture. 3. Packing supplies! Packing peanuts (a rarity these days which is for the best) and what I call "packing pillows" are my favorites for sculpture. 4. Cereal Boxes! They are also great for when you run out of paper...they are the perfect weight to withstand paint. 5. Cardboard! Visit your school cafeteria manager and ask her what she often disposes of. Cans, cardboard, boxes...all of these items are perfect for sculpture. 6. Restaurant supplies! Okay, now I don't want no trash brought into my art room so I never take used items, especially ones that have held food. BUT if you visit your local restaurant supply, you'll find so many great items for sculpture. 7. Aluminum foil! Dollar Tree sells aluminum foil by the sheets and it's the perfect size for the sculptures we create in my art room. 8. Egg cartons! You probably already collect these for paint...but they are also perfect for plaster molds (for candy! Scroll down!) and sculpture armatures. 9. Chopsticks! I love chopsticks or skewer sticks. We use them a ton in my art room. 10. Containers! My husband rinses out and saves nearly every lid (perfect circles!) and container we use for my art room. It may drive me bonkers but we use them all! Now, I know what you're thinking: Stephens! I don't have the storage space for all that! To which I say, that's why you do this sort of craziness at the end of the year. Hoard it, bust it out and then send it all home. 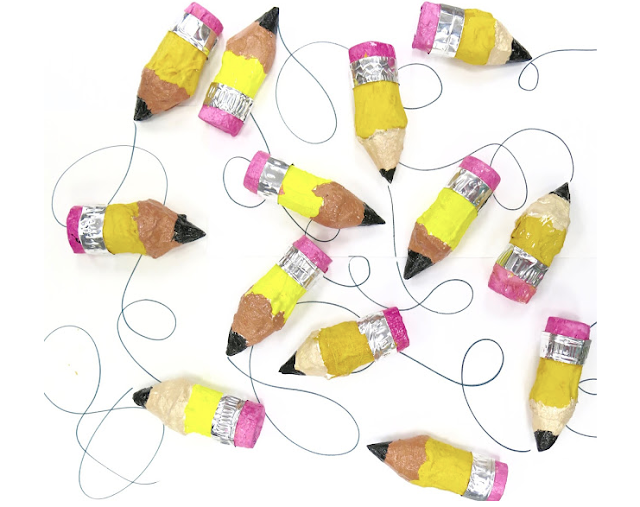 What you don't use, toss them in grab bags and let the kids create on their own at home. 1. Activa Products Rigid Wrap. I LOVE plaster wrap for sculpture. It has replaced papier mache in my room. It dries super fast and leaves the sculptures rock hard. The only draw back is the price, it's not cheap. But it's my go-to and the kids love it. 2. Art Paste. 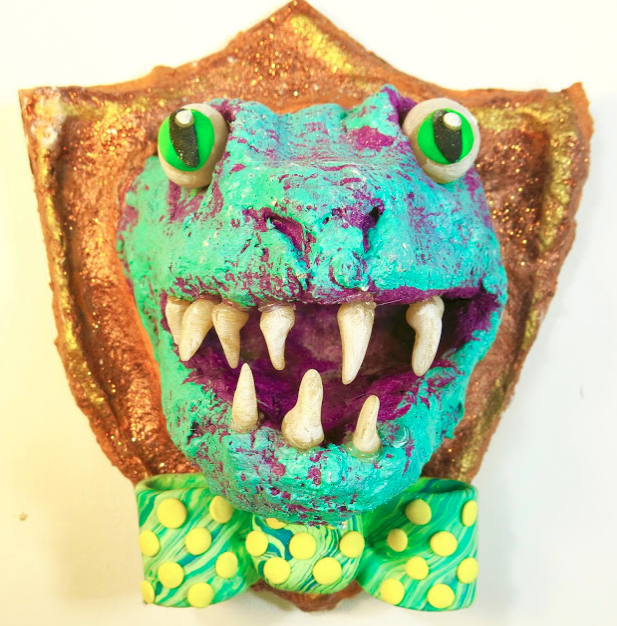 If you GOTTA use papier mache (maybe you love it!) then I recommend Art Paste. It's great stuff. 3. Activa Products Celluclay. If you don't have a kiln, this stuff is great. It isn't like real clay...it's more like a paper pulp clay. You do have to mix it up (I don't recommend having kids do it) and it can be dusty...but I love the stuff. 4. Model Magic. No prep, just open an pack and go. It's not cheap so we use this sparingly. Okay! Now that we have that covered, let's talk projects! 1. Paper Sculpture! 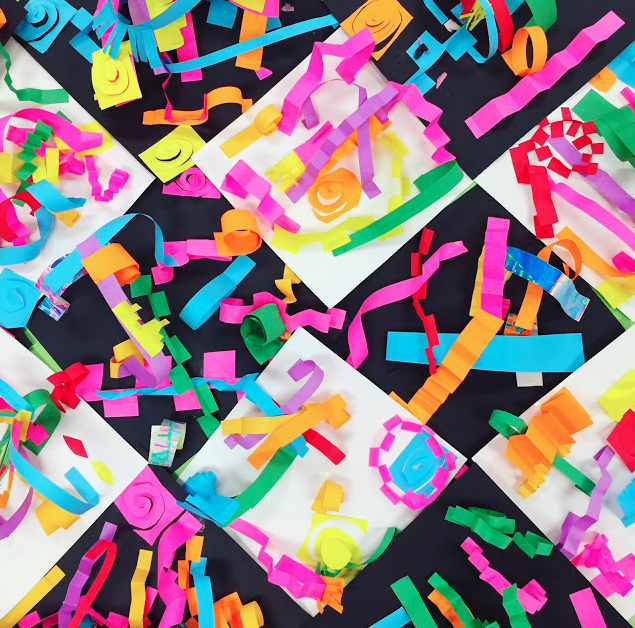 Paper sculpture is a project I do with my kindergarten kiddos on their very first days in art class...and every year THEY ROCK IT. This year, I did it with the entire school as apart of a project I called Getting to Know You Sculptures. 2. Pipe Cleaner and Recycled Sculptures! This is another project that I do with my kindergarten friends. 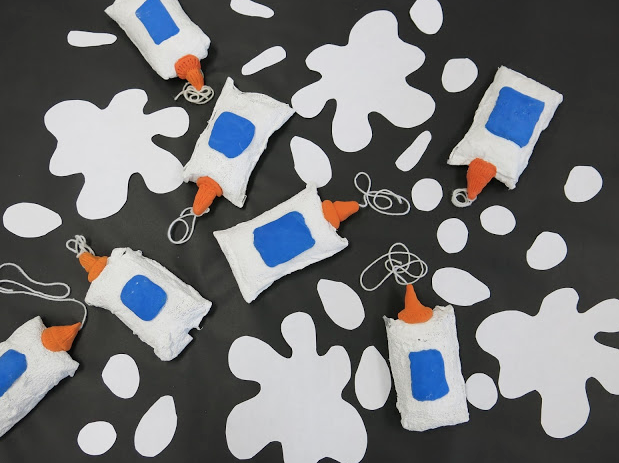 We use insulation foam, pipe cleaners, packing peanuts and, this year we'll be adding cardboard squares to the mix. You can read all about it here. 3. TP Tube Pencils! Need a QUICK sculpture project that is a sure fire hit with your kids? Last year my FIRST GRADERS made these and loved it! 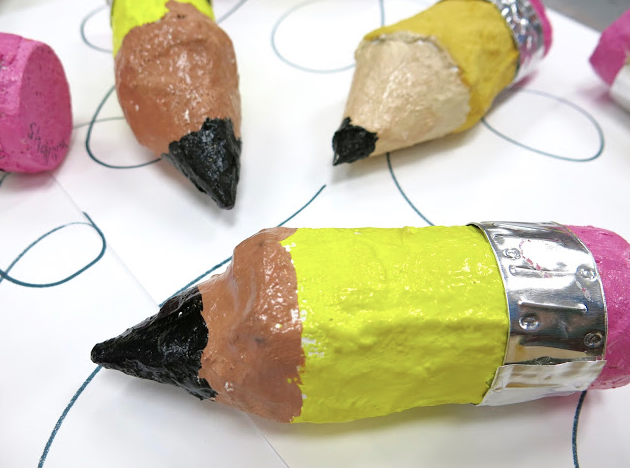 They are made with TP tubes, snow cone paper cones (or tagboard rolled into a cone shape), aluminum foil and paint. All the details with video here! 4. 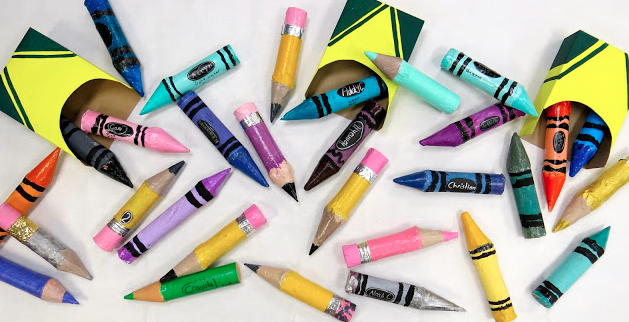 Crayons and Crayon Boxes! Another kid fave, y'all, and so easy. In groups, the kids used cereal boxes for their crayon boxes. 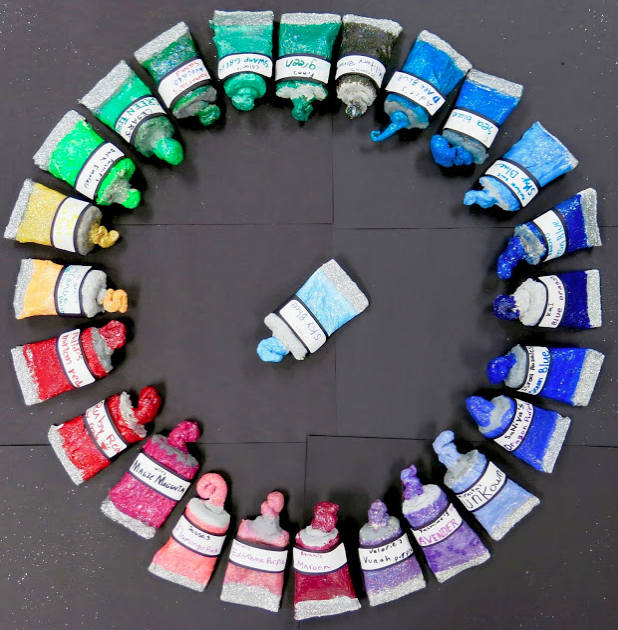 This was also a great way for them to explore color theory as they had to come up with their own custom crayon color. They also had to come up with a name for the color. More here. 5. Paint Tubes from TP Tubes! I think what some folks find daunting about sculpture is the notion that it has to be big and elaborate. You might have a small room, short class time and big classes...so manage your lessons around that. This lesson I think you and your students will love! 6. Spilled Glue Bottles! Do you see a theme here? One of our art show themes last year was "art supplies"...so that's where the inspiration for all of these came from. You can tour that portion of the art show here. Details on these bottles here! 7. Candy Hearts! 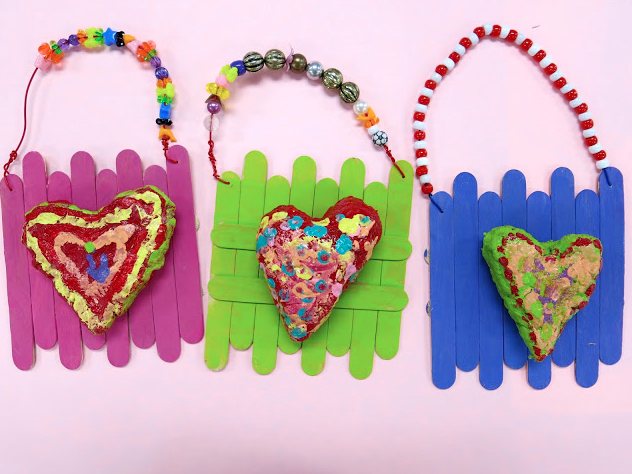 These were so fun to make...while munching on candy hearts, of course. Created with tagboard and plaster wrap. The big box was painted by my early finishers, using a recycled box. All the details, with video, here. 8. Jim Dine-Inspired Second Grade Hearts! These were created with tin foil and Celluclay. Colorful and fun with all the info here. 9. 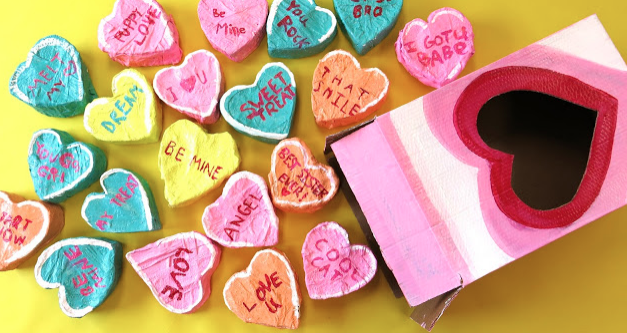 Plaster Candy Hearts! My second graders are currently creating treasure boxes and they think it is the best thing ever. 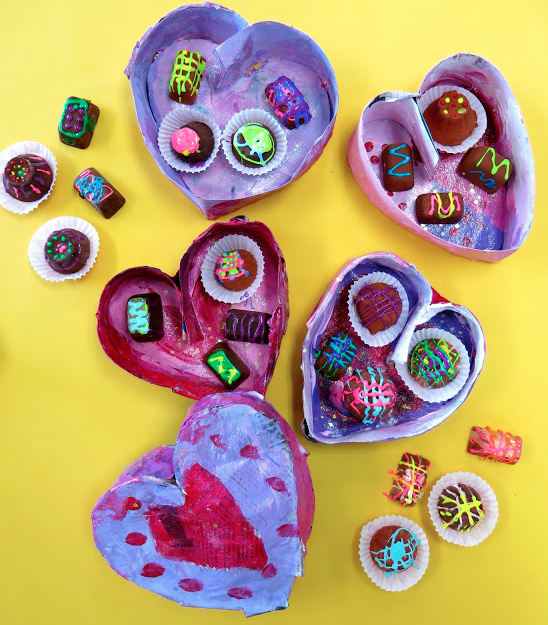 It reminded me of this project a couple years ago...my third grade had created these papier mache candy boxes with plaster candies. They had a BLAST! The candy was created from plaster poured into a variety of molds like egg cartons and ice cube trays. For more info, visit here. 10. Taxidermy Creatures! This lessons has yet to be tested on my students but I've shared it in many workshops and it's a hit. Those teachers have in turn done it with their kids with great success. Just a little foil, Celluclay and imagination for this one. Thank you so much for your excellent tips and wonderful ideas, Cassie. I am starting my own Arty Crafty Club and so value all the exciting ideas I can find.